Understanding the dynamics on networks is at the heart of modern nonlinear science and has a wide applicability to neuroscience. The interplay of network topology and local dynamics opens a variety of dynamical phenomena such as synchronization, clustering, waves, kinks, complex patterns, and chaos. Regular network topologies like global (all-to-all) coupling or local (nearest- neighbor) coupling were intensively studied in last decades. The case of networks with nonlocal coupling, however, has been much less investigated in spite of numerous applications. The recently discovered phenomenon of chimera states has triggered much attention for the study of the nonlocally coupled networks. Chimera states are hybrid spatial patterns, which arise in regular networks of identical oscillators with nonlocal coupling. They consist of parts with high spatial coherence and regions, where spatial coherence is lost. rm the universality of our findings for time-discrete as well as time-continuous chaotic systems . In the present project, we investigate the cooperative dynamics of nonlocally coupled neural populations [3-6]. The individual systems display oscillatory local dynamics, e.g., above a Hopf bifurcation associated with excitability type II. Inhomogeneity of the local elements is introduced in the network via a distribution of system's parameters. Varying the network parameters - such as coupling radius and strength - and in dependence upon the variability of the system's parameters, we analyze spatio-temporal dynamics of coupled systems. Coherent solutions, their stability, and mechanisms of the transition from coherence to incoherence are investigated. Especially, we discuss the occurrence of chimera states that exhibit spatial coexistence of regular synchronized and irregular spatially incoherent regions. This will establish the universality of the coherence-incoherence bifurcation and contributes to a better understanding of synchronization in neural systems. 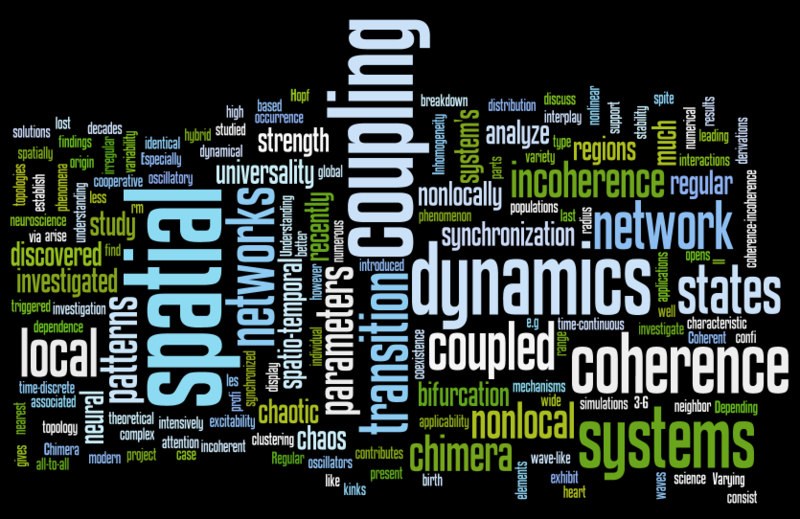 I. Omelchenko, Y. L. Maistrenko, P. Hövel, and E. Schöll: Loss of coherence in dynamical networks: spatial chaos and chimera states, Phys. Rev. Lett. 106, 234102 (2011). 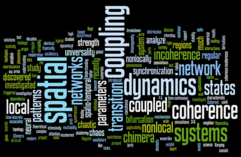 I. Omelchenko, B. Riemenschneider, P. Hövel, Y. L. Maistrenko, and E. Schöll: Transition from spatial coherence to incoherence in coupled chaotic systems, Phys. Rev. E 85, 026212 (2012). E. Schöll, G. Hiller, P. Hövel, and M. A. Dahlem: Time-delayed feedback in neurosystems, Phil. Trans. R. Soc. A 367, 1079 (2009). P. Hövel, M. A. Dahlem, and E. Schöll: Control of synchronization in coupled neural systems by time-delayed feedback, Int. J. Bifur. Chaos 20, 813 (2010). R. Aust, P. Hövel, J. Hizanidis, and E. Schöll: Delay control of coherence resonance in type-I excitable dynamics, Eur. Phys. J. ST 187, 77 (2010). J. Lehnert, T. Dahms, P. Hövel, and E. Schöll: Loss of synchronization in complex neural networks with delay, EPL 96, 60013 (2011).